First Peoples House of Local Elders to meet attendees of the conference which includes invitations on behalf of SC-CC to Elders from other parts of Ontario and Canada. At afternoon sessions on Friday and Saturday, this will take the format of a Circle of Learning around a Sacred Fire held in the tip of Trent University, a short walk outside of Gzowski College. It is possible to understand the importance of the story and the importance of storytelling from an Indigenous perspective. This will be an opportunity for everyone to understand and understand each other's understanding of each other's culture and practice. Why are we humans such suckers for a good story? Traditionally, analyzing stories is territory claimed by writers, literary critics and academics. This presentation will discuss how evolutionary psychologists trace the origins of human storytelling, and how storytelling was central to the development of our species. Chris will perform a few stories to illustrate and play short pieces of audio recorded from his 2016 radio series about this subject on CBC Ideas. Chris Brookes began telling stories onstage professionally in 1974. He is an author, storyteller and independent audio producer who has crafted audio documentaries professionally for three decades. His radio works have won over forty international awards including the Peabody Award and the Prix Italia, and have been broadcast around the world. He has been named an International Audio Luminary by the 3rd Coast International Audio Festival, is inducted to the Newfoundland & Labrador Arts Hall of Fame, holds an honorary doctorate from Memorial University of Newfoundland, and is a recipient of the Order of Canada. He is a playwright, and founded the Mummers Troupe Theatre in the 1970s. The company was known for its adaptation of Newfoundland oral traditions as a vehicle of community development. He has been a member of the St. John's Storytelling Festival (www.storytellingstjohns.ca) since its inception in 2004, a board member 2008- 2016, and a regular performer at the St. John's festival and monthly story circle. Recently he has created smartphone apps which set oral storytelling into the landscape of Newfoundland communities (http://batteryradio.weebly.com/locative.html) He is obsessed with narrative, and keeps telling stories in hopes of someday getting them right. Ena mettra en valeur ses connaissances traditionnelles en partageant l’un de ses propres contes intitulé L’Oie Perdu – une histoire de lutte et de survie qui traite d’un fléau des temps modernes, l’intimidation. Les participants seront encouragés à discuter librement du contenu du conte dans le but de mieux saisir et comprendre les bases traditionnelles des contes indigènes. Différents aspects seront couverts tel que la façon de choisir un conte pour qu’il soit approprié à l’enfant. This workshop delves into techniques and strategies for crafting stories from history to connect visitors to historic sites. Participants will learn tips for research as well as techniques for imaginatively developing a factual story that both educates and engages listeners. Brief excerpts from stories created by Lorraine will illustrate various methods. Participants: All welcome; if possible, bring information about an historic site you are interested in. Lorraine Hartin-Gelardi’s eclectic mix of folktales, literary tales, myths and tall tales enables her to tell stories to all manner of audiences, both young and old, in libraries, churches, retirement homes, schools, conferences and festivals. She finds the experience of sharing stories through the spoken word to have a profound power to enlighten and educate and conducts storytelling workshops for adults and teachers. Through her school residency programs, she helps children to tell and write their own stories. Lorraine particularly enjoys combining art and story in unique hands-on workshops for children and adults. She lives in the Hudson Valley region of New York State. F13: Hone Your Most Precious Instrument, You! Optimiser votre outil le plus précieux : vous-même! This workshop features easy to remember breathing, movement and vocal exercises to help invigorate you as a storyteller. If you wish, bring a short tale you would like to work on. These techniques will enhance your ability to tell lively tales and provide memorable performances. Shoshana shares some of the wisdom she’s learned from 20 years of professional storytelling. 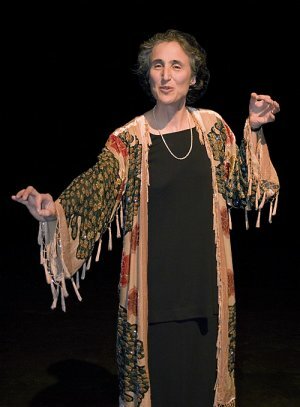 Shoshana Litman tells vivid tales, drawn from traditional sources as well as personal experiences, enlivened with original text and melodies. She has spun insightful stories for engaged audiences of all ages since 1997. First mentored by Indigenous elders in the late 1970's, Shoshana learned that stories are at the heart of many cultures, including her own. She became Canada's first ordained Maggidah (Jewish storyteller and teacher) in 2008, infusing universal truths into her favorite yarns.